How was everyone’s Valentine’s day?! I had plans to write this post on Wednesday night but after eating half of a large pizza, a huge sugar cookie, a slice of red velvet cake, and half a bottle of sparkling rosé, I was pretty much in the fetal position the rest of the night! Luckily, the Proposal was on one channel and the first Fifty Shades movie (I’ve now seen all three in the past week, I have problems!) was on another so I flipped back and forth all night. Nick was home for 12 hours in between work trips so we got to squeeze a little time in together. I was also completely fascinated by Khloe Kardashian and Kyle Richards Instagram stories on Valentine’s Day night. I love when my worlds collide (i.e., Kardashians and Real Housewives) and Wednesday night at Kyle’s house was epic. Kris Jenner, Faye Resnick (the morally corrupt), Kyle Richards, & Mauricio Umanksy completely hammered singing karaoke. I NEEDED to be at that Valentine’s Day dinner. My invite must have gotten lost in the mail. For anyone who doesn’t watch reality tv (may I ask, why not? ), I’m sorry for this last paragraph. 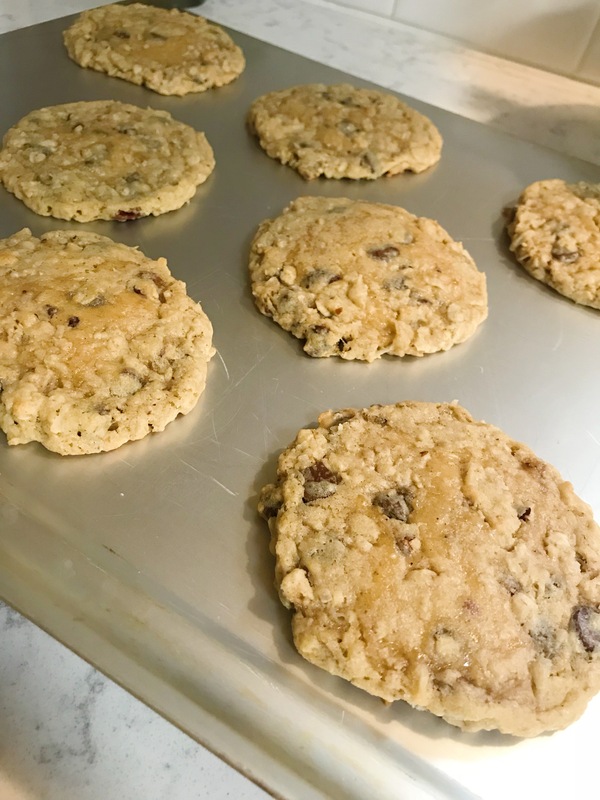 Now on to these cookies…my sister had forwarded me this recipe (Laura Bush’s recipe) a few years ago and I honestly had no interest in making them–the recipe had coconut, nuts, cinnamon, chocolate…I don’t know, it just all seemed too much. My sister is very picky when it comes to sweets and she will tell you immediately what you could have done to make a recipe better (ahem, Kourtney Kardashian). When she insisted that these were amazing, I was convinced to make them. Boy, was she right!! I can’t get enough. 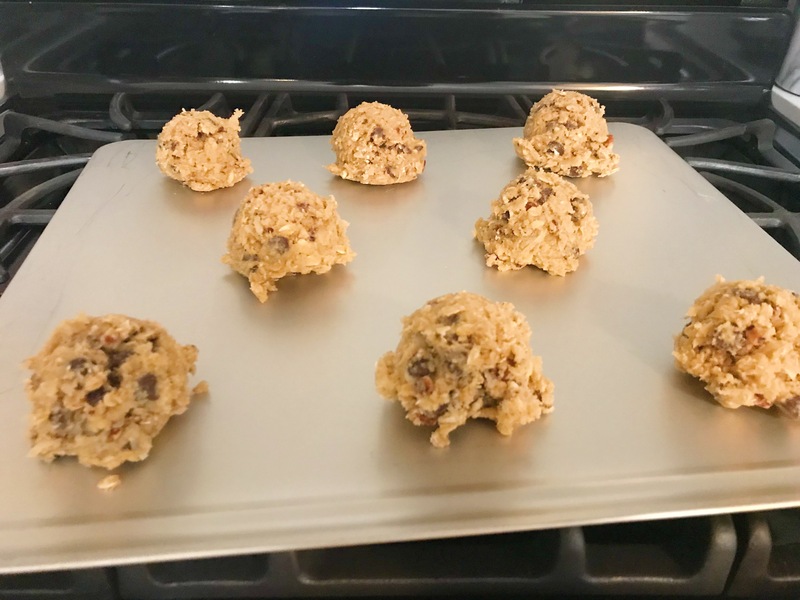 -I’ve made this recipe with small (small cookie scoop, ~1 tablespoon) and large (this scoop, ~¼ cup) cookies and you definitely need to do large. They will turn out good if you make them small but there is something about the large cookie that allows them to be dense and thick to give you all the goodness. See picture below for cookie size/arrangement on cookie sheet. -I always under bake my cookies. I find that my cookies cook for a little while longer while on the cookie sheet. See picture below for how done my cookies are when they get out of the oven (you can see a bit of gooeyness). With mixer, cream together butter, white sugar, and brown sugar until smooth and combined. Combine flour, baking powder, baking soda, cinnamon, & salt. Add flour mixture to butter mixture and combine. Stir in chocolate chips, oats, coconut, & pecans. Scoop cookies on to sheet and bake for 12-13 minutes.